Low Profile and Single Slot are special type of small form factors for graphics card. These SFF graphics cards are used in situations where you do not have enough space to accommodate a regular sized graphics card in your computer case. A low profile graphics card is smaller in width (69mm) and is designed to fit in slim or low profile computer cases. Low profile graphics card is also known as half-height graphics card because they use half-height bracket fit in slim PC cases. On the other hand single slot graphics card is designed to consume only single slot on your computer case and motherboard so that it does not block the adjacent bracket or slot on your motherboard and PC case. A low profile graphics card can also be single slot and a single slot graphics card can be low profile too. However, it is very difficult to find a good graphics card with both these qualities i.e. low profile single slot GPU or single slot low profile graphics card at the same time because there are not many options out there and even if there are then it will be mostly in the budget segment only and most of these graphics cards are under 50 dollars category. 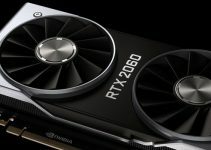 All of these low profile single slot graphics cards have lower power consumption and they do not require external PCI-E power connectors form the PSU. 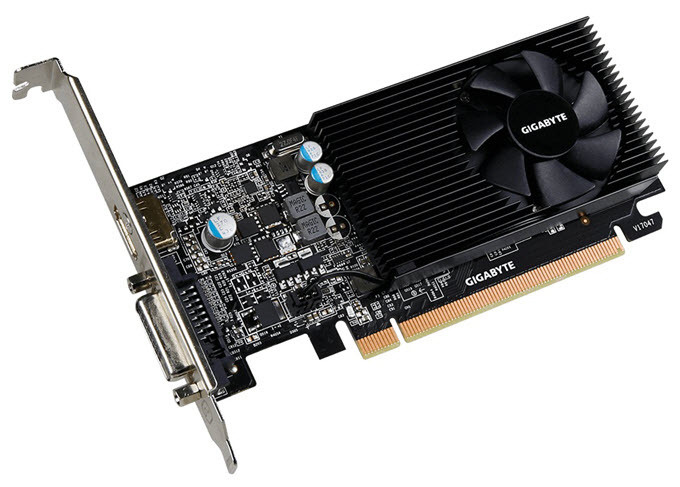 These low profile single slot graphics card are best suited for small form factor (SFF) computers such as Dell Optiplelx SFF systems, HP Slimline Desktops, Lenovo Slim Desktops where only a single slot low profile graphics card can fit. I have already covered low profile and single slot graphics cards earlier in this blog but here I am going to list down the best low profile single slot graphics cards for use in SFF cases or computers where there is no room or clearance to use dual slot or regular sized graphics cards. 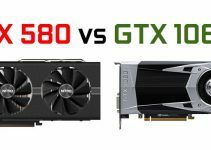 Important Note: There are NO low profile single slot GTX 1050 and GTX 1050 Ti graphics cards (except for ASL GTX 1050 Ti Battle Flag which is very rare) available in the market, so stop wasting your time on searching them. However, you can find low profile GTX 1050 & GTX 1050 Ti and single slot GTX 1050 Ti. You can find them by going to the links given below. Here are the best single slot low profile graphics card from Nvidia for use in SFF Desktops. GeForce GT 710 is an entry level graphics card from Nvidia built on the Kepler GPU architecture. The card comes with 192 CUDA Cores and 1GB / 2GB DDR3 video memory. This graphics card is way better than the most of integrated graphics solutions and can be used to play older games like Counter Strike, Cold Fear, Splinter Cell etc. Also, this is a great cheap graphics card for a low cost HTPC setup and setting up multiple monitors at your workplace or home. 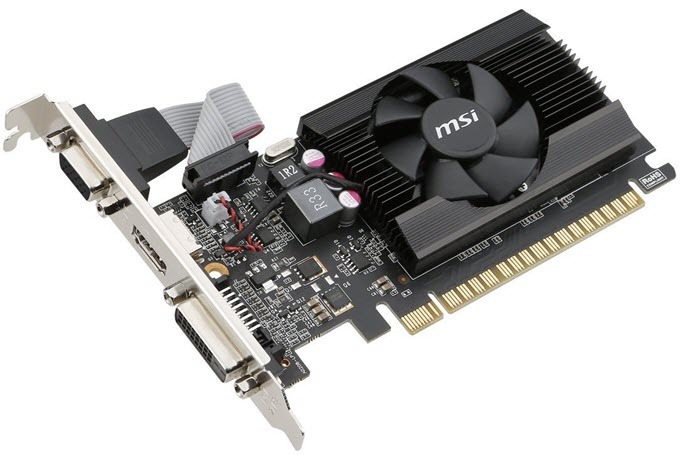 Here we have MSI GeForce GT 710 2GD3 LP which is single slot low profile graphics card and comes with 2GB DDR3 video memory. The card comes with active cooling solution with a black heatsink and a small fan on the middle of it. It is only 146mm in length and can fit in almost all of the small form factor computer cases whether low profile or not. The card does not require external power and needs only a 300 Watt PSU for its working. The Connectivity options for this card include VGA, DVI and HDMI ports. P.S. – If you want a passively cooled low profile single slot GT 710 card then I would suggest you to get Zotac GeForce GT 710 1GB DDR3. 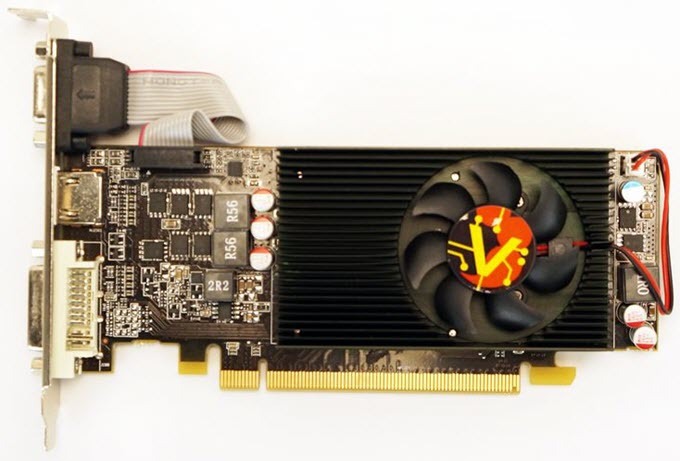 GeForce GT 730 is a much powerful graphics card than the GeForce GT 710. There are three variants of GT 730 graphics card, one with 64-bit GDDR5 memory, other one with 64-bit DDR3 memory and the last one with 128-bit DDR3 memory. The models with 64-bit GDDR5 / DDR3 memory comes with 384 CUDA cores and are based on the Kepler GPU architecture while the 128-bit DDR3 version has got only 96 CUDA Cores and is based on older Fermi GPU architecture. Here we have the GDDR5 version which is the most powerful of all three GT 730’s and is a good budget graphics card for casual gaming, HTPC and for multimedia. You can play games like CS:Go, Far cry, COD comfortably on this card with playable frame rates. Here we have Gigabyte GeForce GT 730 2GB GDDR5 which is small form factor graphics card and is both low profile and single slot in size. For cooling, the card comes with a black heatsink and a small fan in the middle. The card is only 149.88mm in length and has no problem fitting in most of the mini-ITX cases or SFF cases. It does not require external power from the PSU and only a 300W power supply is enough for it. Connectivity options for this card include DVI and HDMI ports. The Model Number for this card is GV-N730D5-2GL. GeForce GT 1030 is a powerful budget graphics card and an entry-level graphics card in the GeForce 10 series. This is the most powerful graphics card that you can get in low profile single slot form factor. The card is built on the Pascal GPU architecture and comes with 384 CUDA Cores. It comes in two variants, one with GDDR5 memory and other one with DDR4 memory. The DDR4 version has much lower memory speed and its performance is literally half of the GDDR5 version. So, you must avoid the DDR4 GT 1030 at any cost. GT 1030 GDDR5 is a great card for low budget gaming and is powerful enough to run games like GTA 5, Rise of the Tomb Raider, CS:GO, Far Cry 5, Prey, Assassins Creed Syndicate on medium graphics settings at 720p / 900p / 1080p with playable frame rates. It is also a very good card for eSports gaming, HTPC, 4K display setup and video editing on budget. 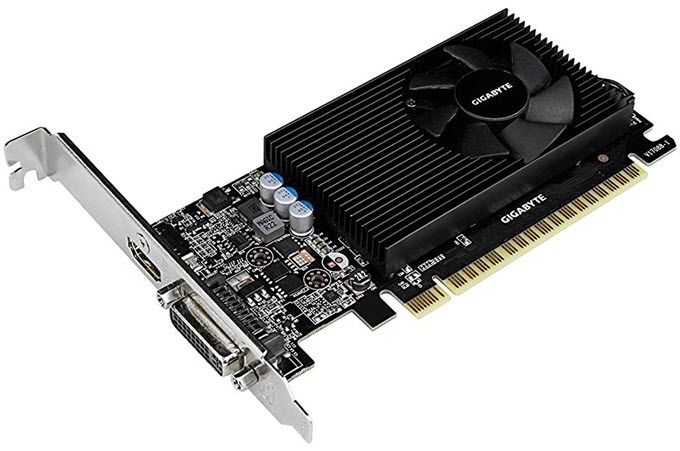 Here we have Gigabyte GeForce GT 1030 Low Profile 2G which is the best low profile single slot graphics card as of now. The card comes with 2GB GDDR5 VRAM and uses a low profile fan and heatsink for cooling. Another good thing about this card is that it is only 150mm in length and can fit in any small for factor PC cases. This an OC version and can be overclocked to slightly higher clock speeds for extra performance via AORUS Graphics Engine utility. Power consumption of this card is on the lower side too and it draws all its power form the PCI-E x16 slot. The recommended PSU for this card is 300W. Display connectivity options include DVI and HDMI ports. Here are the best single slot low profile graphics cards from AMD for use in small form factor PCs. Radeon R7 240 is an entry level and relatively older graphics card from AMD. The card is based on the older GCN 1.0 architecture and comes with 320 Stream Processing Units and up to 2GB GDDR5 or DDR3 video memory having 128-bit interface. This card is faster than the Geforce GT 710 from Nvidia and it can be used for older SFF PCs, HTPC, Blue-ray playback, setting up multiple monitors, playing older games like Counter Strike, Max Payne etc. 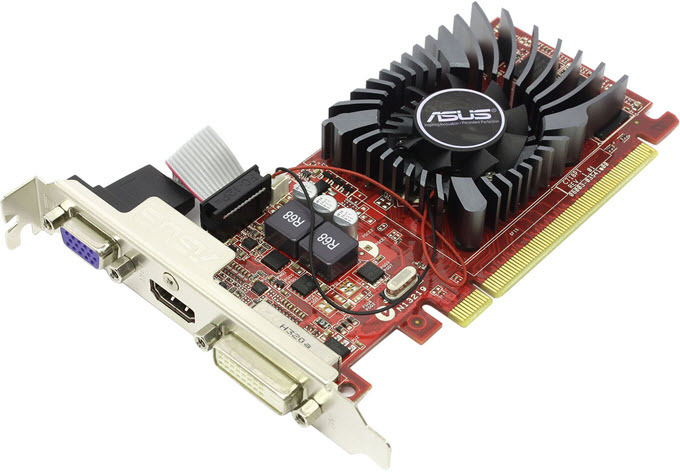 Here we have Asus R7240-2GD3-L that comes with 2GB DDR3 memory with 128-bit bus width. This is a pretty small card with low profile heatsink and fan, and can fit in almost any small factor PC. Like other single slot low profile cards, it does not require external power and includes VGA, DVI and HDMI display connectors. Radeon R7 250 is the bigger brother of the above mentioned Radeon R7 240 card. It is based on the same GCN 1.0 GPU architecture but comes with 512 Stream Processors and up to 2GB GDDR5 / DDR3 memory. The GDDR5 version of this card packs decent amount of power and it is faster than the GeForce GT 730 card from Nvidia. The card is more than capable of running games like GTA 4, Far cry 2, CS:GO, Assassins Creed etc. It can also be used for HTPC, Blu-ray playback, and multiple monitors setup. Here we have VisionTek Radeon R7 250 Low profile single slot card that comes with 1GB GDDR5 having 128-bit interface. A black heatsink and small fan cools down the card effectively. It does not require any PCIe power connectors and needs a 400W PSU for its working. Connectivity options for this card include VGA, DVI and HDMI ports. This is one of the best single slot low profile graphics cards that you can get from AMD. Hi and thank you for very informative article. I just got myself a new SFF from HP and was thinking about also getting a new GPU but it seems that i will continue with my 4 years old 750Ti GDDR5 2Gb card, it seems not worthwile to update, as only option would be GT 1030 that will not add much performance, could be quite opposite, actually. Yes there is no point in getting GT 1030 over the good old GTX 1070 Ti. The only worthy upgrade would be GTX 1050 Ti. time and time again I’ve been told there’s no such thing as a low profile “single slot” video card if by that you mean all three types of video connector on the one low-profile bracket. Is there such a beast in reality? Retailers tell me I’ll need two slots if I want VGA connection, since the other two will be on the GPU board, with the VGA “hanging off”. thanks, so in effect if one needs VGA there’s really no such thing as a “low profile, single slot” GC — in actual practice, in fact, if one’s using an old Lenovo SFF desktop with VGA it’s actually so crammed that it takes up THREE slots — though with only two slots being open to connections. Quadro P1000 is 1050Ti and is a low profile single slot card with low power consumption. Available with 4Gb GDDR5. What is bad about it? I have only listed the regular or gaming graphics cards here and not the workstation ones. Also, Quadro P1000 is more of a GTX 1050 (not the Ti) as both of them come with 640 CUDA Cores. However, all these cards (Quadro P1000, GTX 1050, GTX 1050 Ti) have the same GPU, which is GP107. For your system specs, I think GT 1030 is pretty good and it offers decent performance too. However, if you want more powerful graphics card then you have to upgrade your PSU to at least 300W. I suggest you to get Gigabyte GeForce GT 1030 Low Profile 2G or ZOTAC GeForce GT 1030 2GB GDDR5 Low Profile. They have power consumption of 30W only and are compatible with your Dell SFF PC.